Go one on one with MI instructor Ross Bolton to get that funk groove with your guitar! 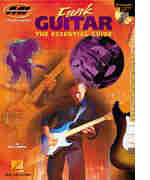 This book/CD pack covers: movable 7th, 9th, 13th and sus4 chords; 16th-note scratching; straight vs. swing; slides; single-note "skank" and palm muting; songs and progressions; and more. Includes 70 full-band tracks.